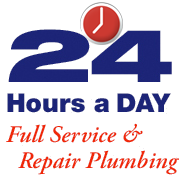 We offer 24-hour emergency service 365 days a year, including major holidays, for our customers’ convenience. Our office hours are Monday through Friday from 8:00am to 5:00pm. If you call after hours, your call will be routed to our after hours automated phone system. You will be prompted to leave information about your plumbing needs and one of our friendly staff will return your call promptly.